Servants have generally little idea of proportion, and in bluing clothes they seem to have a propensity to color too highly. This should be restricted, as it deprives the clothes of that snowy appearance, which is their greatest beauty. Shake out each piece [of linen] and dip it in a tub of blue water, first stirring the water up so that it does not make the linen streaky. Before we had modern laundry detergents with optical brighteners, there was a mysterious little blue bag which was stirred around in the final rinse water on washday. This was laundry bluing or blue. A factory-produced block was the "modern" (mid-19th century onwards), commercial version of older recipes for whitening clothes, with names like stone blue, fig blue, or thumb blue. It disguised any hint of yellow and helped the household linen look whiter than white. Until the mid-20th century Reckitt’s blue-bags were well-known in many countries, sold as penny cubes to be wrapped in flannel or muslin, or sold ready bagged. The product had various names over the years: Reckitt's Blue, Bag Blue, Paris Blue, Crown Blue, Laundry Blue, Dolly Bags. The main ingredients were synthetic ultramarine and baking soda, and the original "squares" weighed an ounce. Reckitt’s had been in the blue and starch business in Hull even before they started importing French ultramarine in the 1850s to make the new blue rinse additive at their English HQ. 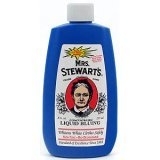 They built up a major international brand, with various lesser rivals, notably Mrs. Stewart's liquid bluing in the US, and Dolly Blue in the UK. Reckitt's wanted people to know their blue was used in the royal laundries, and Victorian advertising in the UK carried a recommendation from the Prince of Wales' laundress. I have been laundress to the Prince of Wales for several years, and I consider Reckitt's Paris blue is the best I ever used, and is undoubtedly greatly superior to the old-fashioned thumb or dark blue. This was such a cheap, widely-available source of ultramarine, that it was used in paint, dye, and ink across the world. It's been found in early 20th century clothing made by indigenous people in Quebec, and in the ink used in Coptic manuscripts in 1930s Egypt. Now it's sold for yet another purpose: providing the blue water for magical rituals from various Caribbean traditions. By 1900 one brand of laundry blue from north-western England was packaged in little bags with a distinctive stick peeking out of the bundle. The stick-handle could be used to dip the blue in and out of the water, while also reminding people of a washing dolly or dolly-peg. Their advertising used cute girl dollies of course. The name Dolly Blue and the stick concept are part of the history of English law since the manufacturer, William Edge & Sons, fought two court cases in 1900 and 1911 in an effort to protect their brand. (These are still cited by English lawyers discussing intellectual property law etc.) Edge & Sons merged with Reckitt & Colman, but closed in 1968. Reckitt also acquired Robin Blue, now a leading "post-wash whitener" in India and Pakistan. Before factory-made chemicals were available, clothes were whitened with blue derived from indigo, or from powdered blue smalt: ground glass containing cobalt. The indigo was processed, mixed with starch, and sometimes other additives, and formed into lumps. This was stone blue, or fig blue, or thumb blue. Other names which have been used for bluing whiteners include Mecklenburg blue and Queen's blue. Prussian blue, still an ingredient in at least one modern bluing liquid, was discovered in the early 18th century, and used on laundry long before synthetic ultramarine. Powder blue was bought loose, by weight. Blue mixtures were often called "blue starch". Extra starch might be added, depending on what was being laundered. An 18th century housekeeping manual described a good method for white linens and cottons. Moisten the quantity of starch you want to use, according to the quantity of your cloaths, with water, and put as much stone blue as is necessary. When the starch and blue are properly mixed, then let the whole boil together a quarter of an hour longer, taking care to keep stirring it, because that makes it much stiffer and is better for the linen. Such things as you would have most stiff, ought to be put first into the water, and you may weaken the starch by pouring a little water upon it. Starch ought to be boiled in a copper vessel, because it requires much boiling, and tin is apt to make it burn. Some people mix their starch with allom, or gum arabic, nothing is so good as isinglass, and an ounce of it is sufficient to a quarter of the pound. Finer clothes would need more careful treatment. White lace should be dipped in "blue water" made with stone blue, said Constance Hall in the 17th century. Finishing touches for a lace collar might include "going carefully over it with a sponge charged with water in which some gum-dragon [tragacanth] and fig-blue have been dissolved," according to Victorian writer Isabella Beeton. Bluing happened both before and during the starching of fine muslin. In Elizabethan and Jacobean England, starch was sometimes mixed with other colours, to tint ruffs and collars according to fashion. (Cream lace, tinted with yellow, was in vogue for some of the 17th century.) Blue starch was out of favour for a time, after Queen Elizabeth banned its use in London in 1595, when extreme blue ruff fashion seems to have become associated with immorality, but soon the manufacture of "smalt or blue starch" was once again approved by Parliament as a means of setting "many poor people a-work", and it continued as a basic household essential for centuries.